Overnight the horror of this situation was added to by the news that an Israeli missile has killed 17 members of one family. Every day the rising death toll in Gaza along with the more than 1,300 injured by the continuous Israeli shelling , has left the population terrorized and in fear. The sight of the horrific pictures of severely burned victims along with the inability to escape this savage punishment has created a sense amongst the population of certain death. When you see someone kill a child, you perception of humanity changes! The rest of the world, so busy with its own affairs not always paying attention continues to accept that these “bombardments” will happen occasionally. After all, Palestinians are just little creatures to be crushed by a giant foot; terrorists who must be annihilated. Those killed are never named, and we only hear the numbers, in statements connected to the militants the world blames for their deaths. But these people had flesh and blood, they looked like you and me. They had lives and dreams; they laughed and cried, grew and loved, and now leave mourning mothers with hearts full of pain. All the while the madness of Netanyahu continues, unfettered and with impunity. It never ceases as he expands proxy-annexes Palestine, blockades Gaza and imposes the Israeli Apartheid. 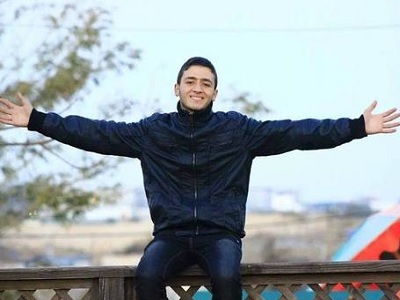 So eight days ago to punish one of the Hamas’ activists, the Israeli’s in all their entitlement justify this cruel, brutal and collective punishment. They target civilian areas with their missiles proven by the devastation of more than 350 homes, and knowing this is a violation of international law and conventions, Israel continues its assault. In 2009, 1400 civilians were killed in Gaza by Israel, thousands maimed and injured, infrastructure and buildings decimated with no chance to correct because there is still the blockade. Knowing all this, there has been enough killing and vengeance to last a lifetime and yet it never ends. What has any of it achieved . . . except more hatred and division? I despise the world’s silence and the US’s backing of Israeli behavior, financing of this operation with their $3.3 billion dollar gift just two months ago. And as I sit here and contemplate it all, there is no logic to it, no justification for this punitive punishment. Israel has convinced itself so deeply that all the land should be Israeli and the people on it have no jurisdiction, no right to live in harmony. Their constant emotional reactions and its friendship with the US along with US aid, keeps the situation going. The concept of Israel, as it is now, is not sustainable. It consists of an Americanized lifestyle mixed with religious apartheid based on WW II war crimes and colonial politics. It is a military republic where every citizen is either a full-time soldier or in the reserves. We can’t talk about real solutions because it offends the sensibilities of American pro-Israeli supporters. How long will America be able to protect Israel? Every time the Israelis expose their fascist policies, their racism, their basic lack of humanity, they add to a growing global contempt for Israel. They operate with impunity as they act aggressively whether it is occupation or war They destroy futures whether it is death, imprisonment, torture or inability to function normally, and with all that, they are the victim, even though the statistics show different. We have saying – one death equals 1000 Palestinian deaths, and it has been shown to be over and over. This bloody rampage gone on for 8 days and God knows when it will end. There is nothing worse in life than being glued to the TV screen, watching one’s people being slaughtered hour by hour and being helpless to do anything. While Israelis take selfies in shelters, go to the beach in their bikinis and eat with their families like most normal people do, Palestinians pull loved ones out of the rubble. Blowing up a home isn’t collateral damage as the people in it aren’t even human – referred in the media as militants, insurgents or terrorists: it is savagery. The eyes of the world don’t even seem to blink at the continuous procession of funerals or at those made homeless in Gaza. Nobody talks about the impact of the tanks, helicopters, gunships and fighter jets that bombard a region that is equivalent to 5 percent of urban Toronto. As an educated Palestinian-Canadian woman, I have come to understand that what the media refers to as an “international community” is a loaded term and really means Israel and the United States and its allies. The ‘international community’ is a loaded term. When it comes to Israel and Palestine it means a lot of talk and little or no action. The formerly oppressed are now oppressors… they have successfully created a system in America that leads it down the wrong path. In forty years, they – Israel – built a system of lobbyists, policy makers, disseminators of information and they bully the government and media to only accept their terms. By being able to do so, thousands of situations are under Israeli control in America, including the US tax payer funded nuclear weapons in their arsenal. The Israeli People and their government carry out their slaughter with impunity as the West allows them to operate unfettered. They commit their atrocities against defenseless people who are deprived, by the powers of the world, of even the most basic of arms all the while denying their humanity and right to exist. Who will step forward to sanction Israel, to stop aid to them as has happened to other nations that violate international law and morality? Nelson Mandela’s statesmanship should be emulated to find common ground with the oppressed Palestinians while responsible elements sort out the intransigence of Hamas. . Palestinians are burdened with the role of victim that is not of their choosing or their making. Where is the statesmanship in all this? We are caught in the cross-fire of conflicting and opposing interests in which solutions are mutually exclusive, with no voice and no place to hide. Why is it that humanity is deaf to the cries of Gaza’s children and of its entire population, trapped in their open-air prison for more than seven years? Israel is a country that is in contempt of international law. It has invaded and stolen land from its neighbors. It mobilizes tanks and aircraft against unarmed civilians. It ghettoizes people. It is a country that, in attacking civilian transport in international waters, openly violates UN resolutions, yet is not suspended from membership. It appears to be untouchable Gaza is no longer a land of farms and commerce. It is a place of devastated livelihoods, with a poverty rate of more than 70%. The Israeli siege of Gaza has gone on for more than seven years, despite public and international condemnation. Today, while you enjoy your family meal living in the security and comfort of home – think about how you would feel if you were a Palestinian from Gaza, missing relatives the way of life you once lived and loved totally shattered. Ask yourself, how it is that the so-called free world is blind, deaf and dumb towards anti-human atrocities, perpetrated time and time again? I am a mother, a sister, a wife, a daughter, a niece, a cousin, a grandmother, and I think that you, the reader understand what I am saying. I matter to someone, to many in fact, just as they matter to me. This is why I am so outraged, consumed with grief and so frustrated by the apathy I see. The media broadcasts leave me bereft of emotion. Where will my next tears come from? Are we not all human? Is that a question that needs reasoning? Don’t all humans react the same when calamity or when tragedy strikes? 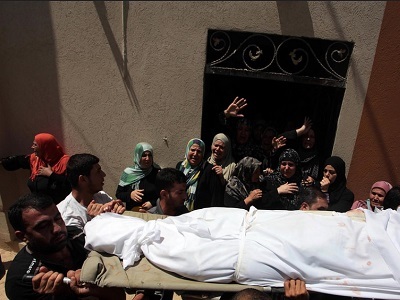 Is a bereaved Palestinian mother’s pain less than any other mother of the world? With all that the Jews have suffered in their history, why haven’t they made the connection that they are now the abusers. They now inflict the misery. And they have no willingness to appreciate the suffering they have caused. The only hope I have are the enlightened Israelis and the growing worldwide community that seeks to wake up those in power who could change this outcome. They recognize the pain of ordinary Palestinian men women and children and see the futility in this matter. They know that the Palestinians self-determination is their right and freedom for the future. Sometimes I think things are shifting and that a movement in support of fairness and recognition of Palestine’s plight is growing. At a time like this I don’t see it. – Rana Abdulla is a Palestinian Canadian writer and activist, originally from the Palestinian village of Balaa near Tulkarem. She is an advocate for refugee rights, and her work has been highlighted by Canadian media. She contributed this article to PalestineChronicle.com. My deepest condolences to the bereaved family.. When will we have an end to these anti-human activities..!!! A question without an answer…..
As a South African, I feel your pain and I speak for many when I say that the people of Palestine have our full and undivided support and attention. It is sad to see how so many previously disadvantaged people are unconcerned by what is happening to our fellow brothers and sisters. It was not too long ago when we were also faced with apartheid. But unlike the puppets we have today as so-called leaders I will remind them of the humble words of a powerful leader, Nelson Mandela…”The South African revolution will not have achieved its goals as long as the Palestinians are not free.” May Allah Swt protect us all. Wonder if the Muslim neighbors have any conscience left in them.. When will they wake up?????? Oh Allah surely to you belong the kingdoms in the heaven and the earth, Oh Allah replace those Muslim leader who secretly give their allegiance to the Zionists and assist them in killing our brothers and sister in Gaza and help us to choose leaders among us who would uphold the dignity of Islam.